Is anyone up for quick, easy, one pot meals? I though so! Like so many of you, I too am constantly on the look out for one pot meal wonders. For me, its a tad easier when I have the option of using meat or seafood to flavor it up. This tava pulao took me by complete surprise. Tava means griddle and pulao means a savory rice preparation, so the name doesn't really talk about how wonderful this vegetarian one pot meal is. 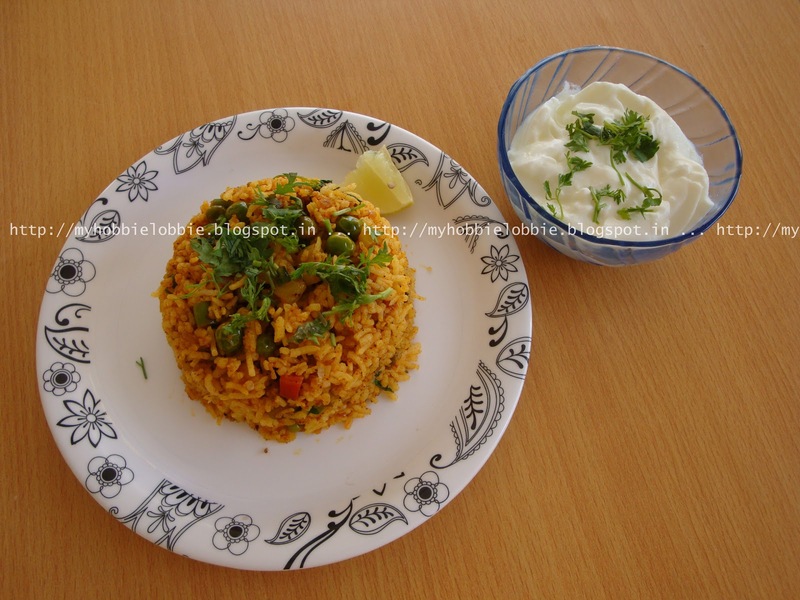 Tava pulao is also considered street food and can be found at street food carts in most parts of the city. I've seen a couple of such carts, and although I'm not a snob where street food is concerned (I love chaat), I just haven't been able to get myself to eat a portion. However, I did manage to sample this a few times at the office cafeteria. Those of you who've been subject to cafeteria food atleast in Mumbai, know exactly what I'm talking about. While being edible, their version of this pulao wasn't spectacular or even flavorful. You need a curry to go through it. While I was on the hunt for some vegetarian recipes that I could add to my arsenal, I came across a recipe for Tava Pulao. I hadn't thought about this in a while and when I saw it, I decided that this was as good a time as any to try it out. So this was our Sunday lunch a while ago. Looking at the ease of putting this together, initially, I was a little skeptical about how it would turn out. But we enjoyed this so much, that I've made it on two other occasions since then. It has a lovely assortment of vegetables and is beautifully spiced. You can use whatever assortment of vegetables you have at hand. As far as the spices go, the original recipe calls for Pav Bhaji Masala. I didn't have any, so I just left it out and it turned out fine. I was questioning the practicality of having to buy an ingredient to use in just one dish and that kept me from buying it for a while. But I now want to try making my own Pav Bhaji (which is another favorite in our house), so I picked up a box of the masala yesterday. I'm eager to see how it impacts the flavor of this dish. So stay tuned to see how my Pav Bhaji making endeavor fares, but in the meanwhile, here is the recipe for the Tava Pulao. Wash and soak rice for about 10-15 minutes, then boil the rice till done. Don't overcook it, you don't want it to turn mushy. Using a fork, fluff up the grains of rice and let it cool down a little. In a large pan (originally a tava is used, but I didn't have a large enough one, so I just used a pan instead), heat some oil and tip in the cumin seeds. Let them sputter while making sure they don't burn. Add the onions and stir fry till slightly browned. Add the chopped vegetables and saute for about 5 minutes. They should be cooked about 3/4 the way now. Add the powdered spices and mix well, taking care that you don't mash the vegetables while stirring. Add the cooked rice to the veggies and toss well to mix. Add a dash of lemon juice and coriander leaves to finish off. Serve this with some raita. I served it with a plain yogurt sprinkled with some chopped coriander leaves, but you could also serve a mixed vegetable raita instead. I'm so glad I don't have to deal with that atleast for the time being! Thanks for taking the time to drop by Justine! Tawa pulao looks delicious. I love that. Thanks for sharing with Hearth and soul blog hop.